As a data sensemaker and communicator, and also as a teacher, I strive for clarity. However, the field in which I work—data visualization—is a cauldron of terminological confusion. Is it a chart, graph, or plot? Is it a data visualization, information visualization, or infographic? Is it a report, dashboard, or an analytical display? None of these terms have clear definitions. Even the word “data” itself breaks the world into camps: Is data plural or singular? This terminological (and terminal) confusion distracts us from the things that matter. The representation and presentation of data to facilitate understanding. I was pleased that Andy declared data visualization’s goal as understanding, but I was disappointed, above all else, by the fact that it said nothing about the visual nature of data visualization. There are many ways to present data to facilitate understanding other than those that are visual (a.k.a., graphical). According to Andy’s definition, if I express data in the form of a paragraph consisting of words and numbers to facilitate understanding, I’ve created a data visualization. But that’s not right. Its visual nature is integral. The visual display of data to facilitate understanding. Whether we display data to make sense of it or to communicate it to others, no distinction (“representation and presentation”) is necessary in the definition. The visual display of quantitative data to facilitate understanding. Now we have a definition that’s simple, accurate, and clear. This certainly isn’t the only possible definition, but it’s now one that works. I would expand the defninition beyond strictly quantitative information. Consider the list of names you mentioned. Coloring them according to discrete, non-quantitative categories would be using visual attributes to convey some useful information. Drawing lines between names such as an org chart, genalogy, or other node-link diagram is also a visual display of information that isn’t built on quantitative data (although quantities may be inferred by the viewer). I understand that one could call a presentation of data of any type a data visualization if it encodes something visually. What I’m saying is that the term data visualization has traditionally been reserved for visual displays of quantitative data only. Other terms have been used for displays that contain only categorical or qualitative data, such as diagrams. I would normally be inclined to defend my views on this in detail – especially having clearly caused such ‘A Cauldron of Terminological Confusion’ – but I’m unwilling to spend my vacation time engaging in semantic debates. All I can say is that it works FOR ME – it helps me organise my thinking about this subject – and that’s surely what a personal definition should accomplish. Folks can make their own mind up about the legitimacy of this definition by freely accessing the full opening chapter – it will add more context and flesh out the discussion from my perspective far better than writing an essay in this little comment rectangle https://uk.sagepub.com/en-gb/eur/data-visualisation/book244865#resources. I did not mean to suggest that you have contributed a great deal to the “cauldron of terminological confusion” that plagues our field. In fact, you are much more concerned about clarity than most data visualization authors, which I appreciate. What I see as problems in your definition of data visualization are not typical of your work, which is in part why your definition surprised me. As I implied, I suspect that these problems are due to a lack of feedback from others who work in the field. On several occasions I have come up with definitions or ideas that seemed great to me until I ran them by others, baffled that I missed the obvious. I wonder to what extent it matters. How much does it matter whether I view data as solely quantitative or if I include qualitative data when I’m visualizing it? Who is really struggling with the definition? Are masses utterly confused because one defines data as quantitative while another includes qualitative in their definition? What is the impact of differing definitions? I suppose I look at data visualization as a way to communicate, so through that lens, I think the distinction may be less of an issue. You have misunderstood me in part. I did not say that including qualitative data excludes a display from being as a data visualization. I said that the term data viualization traditionally only applies to displays that include quantitative data. They may certainly include qualitative data as well, and in fact always do. Quantitative data means nothing without associated categorical labels. Whenever two people talk about something, unless they have a shared understanding of a term’s meaning, the result is confusion and miscommunication. Given the fact that you “look at data visualization as a way to communicate,” you should definitely care about clarity in definitions. Clear, shared definitions is the bedrock of communication. I’m with Emily. Why do we need to stick a name on everything? Frankly, I could do with fewer words and more meaning. If something is purposeful, I don’t give a hang what it’s called. I could do with fewer words and more meaning as well. This is precisely what I’m advocating here. Good question. You might think that we could drop the word visual because display always means visual, but it actually doesn’t. By “visual display” in the context of data visualization, I mean that the data is primarily presented graphically, as opposed to textually (i.e., words and numbers). Text in always included in a data visualization, but the primary encoding of values is visual in nature. For example, even though I talk a great deal about the value of tables as a means of quantitative display, I don’t consider tables a form of data visualization unless something visual is included to encode meaning. Given the fact that this blog post is about confusing terminology, I’ll point out that I consider a table a type of chart. Many (perhaps most) people use the terms chart and graph interchangeably. I don’t. I use chart as an umbrella term for several forms of data display, including tables, graphs, diagrams, and maps. Based on this definition, not all charts are data visualizations. I think it’s interesting to see the definition of “data visualization” as a power struggle. If you control the meaning you have the high ground. Newspeak. This is an endless and sterile game. That’s why I prefer to see “data visualization” as an umbrella term that defines the basic process: a visual translation of an underlying table. It doesn’t matter if it is quantitative or qualitative and (heresy alert) it doesn’t have have to help you understand. As an umbrella term, you do need to have more specific terms under it, each one defining their real goals. I know you strongly disagree with this, but to me, an Excel user that sees data visualization from a lite perspective, this seems a good starting point, instead of trying to come up with a one-size-fits-all definition that will be rejected by many. Over and over again. I’m not aware of a power struggle going on here and I’m not advocating a one-size-fits-all definition of data visualization. Your definition of data visualization as “a visual translation of an underlying table” is a bit confusing and is definitely incomplete. You might be right, however, that this definition could work for someone who thinks of data strictly as Excel tables. I find it can often be useful to have a working definition for things. As such, I’ll offer a couple of thoughts. As we’ve had to spend time explaining that we are differentiating between graphical and textual by including the word “visual”, we might consider exchanging “visual” for “graphical” if this is what is meant. I find the inclusion of “quantitative” to be unnecessarily narrow in scope. Data visualization is the graphical display of data to facilitate understanding. Although this too is imperfect, it seems a reasonable definition for me. Give me an example of something that you would call a data visualization that doesn’t include quantitative information. A very timely post, as I’ve been spending a good bit of time lately on the topic of definitions. Coming up with these definitions is certainly not an easy task. I was actually discussing your definition of a dashboard from Information Dashboard Design last night in my data visualization class. I split your definition up into two parts. “A dashboard is a visual display of the most important information needed to achieve one or more objectives…” I really like this part, and we see the word “visual” in there, as you mentioned previously as an important word. Where I disagree is the second part of the definition. “…that has been consolidated to a single computer screen so it can be monitored at a glance”. I don’t believe a dashboard has to be “consolidated to a single computer screen”. Your second edition book cover shows a great example of dashboard that is on an iPhone. Now maybe you consider the definition of a “computer screen” to be broad, including phones, tablets and televisions. Even so, if I print a dashboard on piece of paper and bring it to a meeting, is it no longer a dashboard? And I also disagree that it has to be on one screen. You mention that if the data is on multiple screens then it becomes multiple dashboards, yet on page 36 you write, “Allowing navigation to further detail or to a different set of information that best serves its purpose by standing alone can be a powerful dashboard component.” This is contradictory. You state that a dashboard should be on a single screen but it can also have the ability to navigate to further detail? Doesn’t this also contradicts “information at a glance”? If a dashboard is built on the mantra of Overview, Filter and Details-on-Demand, then it’s certainly possible that the dashboard would be more than a single screen and can be deeper than at-a-glance. As to the definition at hand, you write in your post, “A list of people’s names alone is not a data visualization. Associate something quantitative with those names, such as people’s ages, and display them visually, such as by using bars of varying lengths, and we have a data visualization.” What is your definition of quantitative in this context? In Show Me the Numbers, you define “quantitative information” as being either “quantitative” or “categorical”. In statistics, this is not the typical definition. “Quantitative” is measures of counts, values or sums expressed as numbers. “Qualitative” is data about categorical variables. So are you saying that data visualization is only a data visualization if it contains measures? In Now You See It (page 12) you describe data visualization as an umbrella term, “covering all types of visual representations”. You state, “whatever the representation, as long as it’s visual, and whatever it represents, as long as it’s information”. This collection “visually represents information”. You state in the comments though that “visual” to you means “graphically”. So I’m guessing you would not consider this website a data visualization? Putting all of your definitions together, it seems you are saying “data visualization is visually representing quantitative information graphically.” And you are including “categorical” data in your definition of “quantitative information”. One example would be relational charts such as database diagram or organizational chart. Each of these present data in a visual way to enable us to quickly understand the relationships between objects. Another example would be a workflow diagram. These present data related to a series of events in a visual way as opposed to a strictly textual way. I’m sure there are other, perhaps even better, examples, but those quickly came to mind. To me, it’s not about quantitative data vs qualitative data. It is more in how the data is communicated (i.e. visually/graphically or textually). Here is a quick example I threw together. All of the data is qualitative (gender, survey response and city), but it is visualized in a way to inform. Thanks for the examples of visual data displays that do not include quantitative information. Org charts, entity-relationship diagrams, an instructional illustration in a car repair manual, and even the map-based example that Jeff provided, are all examples of of visual data displays that have not traditionally been called data visualizations. It is absolutely true that it would make sense to call them data visualizations were it not for the fact that this term was coined to describe displays that include quantitative information. Similarly, we could argue that the term “information visualization,” which is favored by the academic research community, could be used to describe all visual data displays, but it is not. For instance, displays of things that are physical in nature, such as an MRI scan of someone’s brain, qualifies by definition as a “scientific visualization” rather than an “information visualization.” In all of these cases terms were coined to differentiate some forms of visual display from others because these distinctions were useful. If we could start over and coin the terms anew, I would prefer to use the term data visualization for visual displays of data of all types and to use the term quantitative data visualization for displays that include quantitative information. We cannot start over, however. Changing the meaning of terms once they’re established creates confusion. Much of the confusion in terminology today has been created by people who have become involved in the field without knowledge of its past. What confusion would be generated by broadening the definition? I don’t view it as starting over, but rather advancing. Had the original definition included “printed on paper” would we not expand that? By calling something a “visual data display” but not a “data visualization” seems far more confusing. You covered a lot of ground in your comments and I’ll try to address all of your points. First, my definition of a dashboard. I proposed this definition initially in an article that appeared in Intelligent Enterprise magazine. I did so to cut through an enormous amount of confusion that resulted from the fact that the term dashboard was being used to describe everything imaginable. In the definition I stated that a dashboard displays information on a single screen. Why? As you know, I take quite a bit of time in Information Dashboard Design to explain this. What fundamentally differentiates a dashboard from other forms of display is the fact that it is used for rapid monitoring to maintain awareness of what’s going on. If the primary information that needs to be rapidly monitored is spread across multiple screens, it cannot be rapidly monitored, nor can comparisons and connections be made when all of the elements are not simultaneously visible. Can this goal always be met? No, but to support rapid monitoring, we should always strive for it. My statement that a dashboard should provide the means to additional, supporting information, when it is needed, does not contradict the definition. When the dashboard makes someone aware of something that needs a response, it is often the case that additional information that does not appear on the dashboard itself is needed to determine how to respond. Providing a way to easily navigate from the dashboard to that additional information is part of what makes a dashboard work. That additional information can be provided in various ways, such as pop-up windows and reports that can be separately accessed. A report of details on a separate screen that complements the dashboard is not a dashboard itself. Because it is important to provide easy and instant navigation to additional supporting information, I do not consider a printed information display a dashboard in the full sense, for it does not provided this one key bit of interactivity that a dashboard should provide. Regarding the iPhone-based example of a dashboard that appears on the cover of my book, yes, I consider an iPhone a computer. Don’t you? When I say that a data visualization is a visual display of quantitative information, I do not mean to suggest that it consists of quantitative information alone. A quantitative display is only meaningful if it also includes categorical information to tell us what the quantities represent. I understand quantitative information just as statisticians do. It consists of measures. A bunch of measures on a screen without labels to say what they represent, however, is meaningless. In Show Me the Numbers, I do not define quantitative information as either quantitative or categorical. I define it as involving both. In my book Now You See It, as you point out I have indeed contributed to the confusion by using data visualization as an umbrella term that includes both information visualization and scientific visualization. Apparently, at the time, I was trying to differentiate these related terms in a way that differs from my current thinking. It has been many years since I’ve read the particular excerpt that you mentioned. So, I readily admit that my own thinking on these matters is not written in stone and shares in contributing to the confusion. Regarding the Cleveland Museum of Art’s online collection, I do not consider this a data visualization. It is a collection of photos. The fact that you call this a data visualization nicely illustrates the overly broad use of the term that I’m trying to avoid. At this moment, I am sitting in my office. If I look out the window, I see a collection of visual objects (trees, houses, cars, etc.). Is that a data visualization? It is visual and it provides information. We use definitions to draw the lines in meaningful and useful ways. As a data visualization practitioner, I do not consider photography a necessary part of my skillset. In the separate comment that you posted a moment ago, you asked “What confusion would be generated by broadening the definition?” You have illustrated the confusion that concerns me by citing the museums photos of its exhibits as a data visualization. Terms become useless if they don’t have particular meanings. Can we not just leave the definition as this? “Although data visualization usually features relationships between quantitative values, it can also display relationships that are not quantitative in nature. 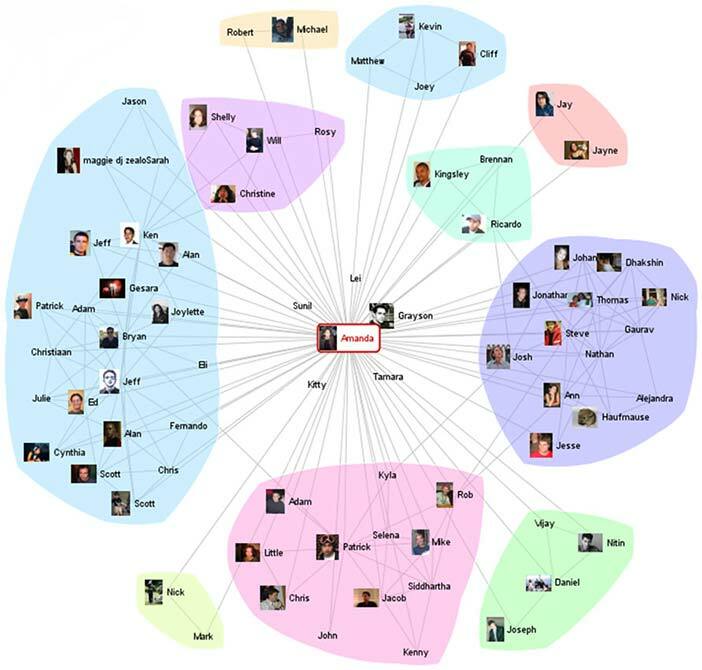 For instance, the connections between people on a social networking site such as Facebook or between suspected terrorists can be displayed using a node and link visualization. In the following example, people are the nodes, represented as circles, and their relationships are the links, represented as lines that connect them. Words are but tools for communicating and, indeed, often do change in their meaning over time. I still feel that narrowly defining data visualization as pertaining solely to quantitative information is unnecessary and even seems at odds with previous statements attributed to you. No, this is not contradictory at all. The dashboard is a single screen, allowing the user to monitor all of the essential information at a glance. However, when monitoring high level information, situations arise when you then need to take action and/or further investigate the information, triggered by some change or status discovered on the dashboard. At that point it is obviously desired to be able to begin that deeper investigation by clicking through from the alert or status that requires investigation, and view additional data. This does not make the “additional data” a part of the dashboard, and does in any possible way contradict the idea that the dashboard itself is intended to be a single, at a glance, view of the high level essential information. As I confessed in my response to Jeff, I share some responsibility for the confusion that exists. Regarding my description of network diagrams, notice that I did not say that they are without quantitative information. Rather, I said that in addition to quantitative information network diagrams feature relationships that are not quantitative. Based on my reading of the chapter, the example used in “Data Visualization for Human Perception” did not include any discernible data that was quantitative, but rather was noted that the example could be further enriched by including quantitative information. With all sincerity, I simply find your previous explanation (in addition to the alternative I proposed) to be more in line with my own thinking. I find both to be perfectly acceptable working definitions. As you have clearly stated your position on this topic, I will have to respectfully disagree that including the word quantitative is necessary. I have to ask, what is the concern for not broadening the definition? I’m curious if there a reason that some of the examples in this discussion (network diagrams, org charts, maps, etc.) need to be included in the definition for “data visualization”? Isn’t it more useful to have a clear and concise definition with some flexibility, than to have a generic term that keeps expanding to accommodate counter-examples and nitpicking? At some point, don’t you wonder what’s the point of having the term in the first place? It’s not like the term is absolutely needed for many of these examples anyway. Yes, technically maps visually encode data, but would you really ever call a map a “data visualization” when you can just say “map”? I think your examples outline the difference between defining a term of use in our field and casual speak. I would not CALL a map in my a car data visualization, but I do believe it is a type a data visualization. I also don’t tell my kids that “I’m going to the sport utility vehicle”, I simply say, “I’m going to the car”, even though “car” is not an accurate term in this case. Steve was talking about the definitions in the context of creating clarity, not what average Joe business user calls them. That person will never use the term data visualization. They will simply say, “send me that…” [report, dashboard, graph, map, org chart], which by my definition, are all data visualizations. What is the benefit of generalizing the definition of “data visualization”? You say the context of this discussion is “creating clarity”, but making the definition all-inclusive does not do make it more clear. It makes it harder to pin down even generally what a person is talking about when they use the term. I just feel like this discussion is more about adjusting the definition to be perfectly-accurate-by-all-accounts than just making it actually useful for discussion. Another example of non-quantitative data visualization can be found in Stephen’s redesign of “Colors in Culture” on page 6 of “Our Fascination with All Things Circular”. Here is a link to the visualization used in the chapter I previously referenced. Each of these qualify as data visualization in my book. No, my concern is with over-generalizing the definition. I feel that doing so – in this instance – undermines the point of having a term or definition at all. On the contrary, I am saying there is certainly a benefit in defining it. I am, however, doubtful that there is any benefit in opening that definition to allow every conceivable exception people can dream up. Definitions can be flexible, with a little common sense. For example, when Stephen defines the term “dashboard” with the words “single screen”, he doesn’t say how big of a screen. Would two screens side-by-side not be a dashboard whereas a single screen that is twice as wide is still acceptable? And would it still be a dashboard if printed on paper, as you suggest? If so, how big is the paper allowed to be? These counterexamples and exception cases simply don’t need to be accounted for in the definition, and adapting the definition to include all of them makes the term less useful. I can only speak for myself, but my view is not aimed at over generalizing a fixed term. If a set of data (regardless of whether it is quantitative or qualitative) is presented in a graphical format (i.e. some type of chart/graph), I see no reason it shouldn’t be considered a data visualization. Would the example of Stephen’s version of “Colors in Culture” suddenly become a data visualization if the qualitative “color” component were replaced with some quantitative measure (e.g. population)? I find both to be data visualizations. Some are probably tired reading this thread and others will view the entire exchange as pedantic, but I do think it’s important that these things are discussed. This is actually a common exercise in other fields. In music school, professors ask “what is music?” and in the field of art there have been legendary battles over “what is art?” (ex. the Mapplethorpe exhibit here in Cincinnati 25 years ago – not that I expect a lawsuit over the term data visualization). I am also not advocating for a wild west definition. This is really about where you draw the line in the sand. I do not think that Steve looking out his office window or a common photograph of something is a data visualization. Nicholas Felton’s new book is “Photoviz – Visualizing Information Through Photography”) so maybe that’s a good term for photography visualizations. That said, I clearly have a broader definition of data visualization than most on this thread. I think the Cleveland Museum of Art is a form of data visualization. Their data is art. The piece of art itself is not data visualization (unless made to be), but the interface allowing me to learn about them, sort them, filter them and drill down for more details makes it a data visualization to me. I can certainly understand people not wanting to draw the line that far away from graphs. Moving closer in, a map showing flight patterns, by my definition, is most certainly data visualization, even if it’s only showing connections from city to city without any measures. Personally, I like Steve’s previous definition from Now You See it (page 12). Data visualization as an umbrella term, “covering all types of visual representations”. “Whatever the representation, as long as it’s visual, and whatever it represents, as long as it’s information”. Unfortunately, if a group of people that actually care about this topic enough to be on Steve’s website can’t come to common agreement on this term then it’s unlikely the broader data visualization community will. We usually interpret data as a collection of information of certain kind. Numbers or names, atomic or complex structures, they are studied in sets. For any set of data they may be defined subsets, but also operations/relations/functions beyond the basic arithmetics. Finite or not, sets and the relations between them can be explored using appropriate visual representations. Network diagrams, hierarchical trees, maps, charts, tables they all display data and they all can be part of a dashboard. I consider data visualization a technique of displaying sets of information in a meaningful way. For what it’s worth, I don’t think it’s your aim to over-generalize the term. I agree that “quantitative” is limiting. There are types of displays that are primarily or solely qualitative, too many to just consider them exceptions. In that case, I agree the definition could be refined. Let me put it another way. You say, “I think the Cleveland Museum of Art is a form of data visualization.” Regardless of your reasons for thinking that, *why* does it need to be classified this way? *Why* does the definition of data visualization need to include it? Furthermore, do you disagree that something can be called a data visualization if the definition doesn’t perfectly account for it? Do you disagree that definitions can allow reasonable exceptions? I’m not advocating that the website gallery needs to be included in a definition, I was just using it as an example. I also agree completely that “quantitative” is limiting, which was my original point in posting. Steve might want to address your broader questions. He wrote in the post, “This terminological (and terminal) confusion distracts us from the things that matter.” and he also wrote, “I strive for clarity.” and I think that’s the point of all of this. “do you disagree that something can be called a data visualization if the definition doesn’t perfectly account for it?” No. “Do you disagree that definitions can allow reasonable exceptions?” No.